I have been experimenting with using Pruvit Exogenous Ketone supplements for going on three weeks now, and shared my experiences thus far on my previous post. I have been so surprised by just how much of a mental boost the exogenous ketones have given me, that I have revised some previously held beliefs. I've come to realize just how much the vast majority of us do not really ever experience the level of thriving mental and physical health we are (or once were) capable of experiencing. I was always pretty adamant about getting my nutrition from my diet, rather than relying on expensive supplements. However, I now see the benefit to taking supplements, or at least these exogenous ketones, along with a few other supplements we often recommend, such as magnesium, and possibly specific herbal formulas for clearing excesses and rebalancing the system, and/or digestive enzymes or bitters for those newly transitioning to a much higher fat and protein-rich diet. Considering how much less mineral-rich our soil and water supplies are, and the length in which most of us have consumed inappropriate foods ~ including those foods that we believed to be healthy, but were nutritionally inadequate ~ along with all the ways we are living counter to our true Nature, it becomes easier to understand why having a boost from external supplements, such as the Pruvit Exogenous Ketones can provide such a noticeable and striking improvement. If I am wanting to, I may still enjoy my morning coffee (half or mostly decaf) adding the Keto Sweet Kreme, or Pumpkin Spice Kreme prior to our training. When ready to eat, I find that I do best with a lighter, somewhat salty meal with fat and some protein, and a more protein-focused second meal. 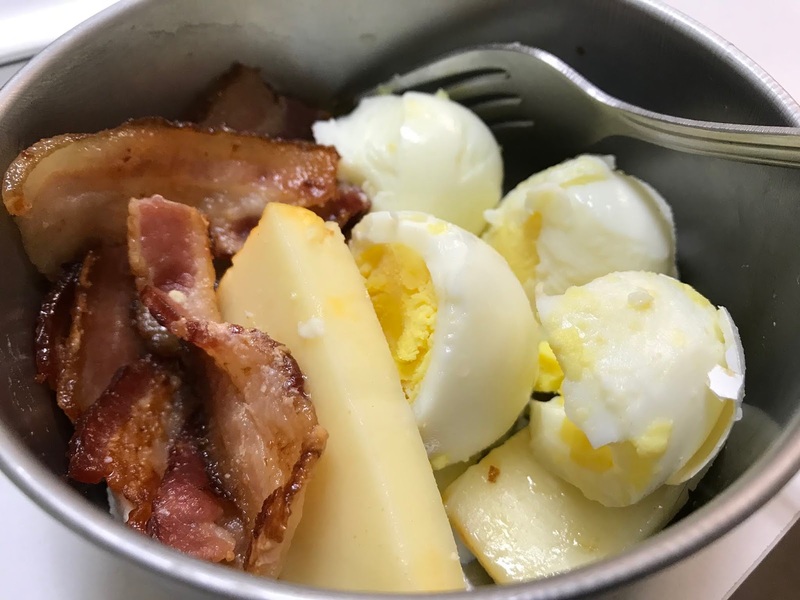 Bacon, possibly with 1 or 2 fried (or boiled) eggs, and/or a little cheese has been perfect. The Exogenous Ketones, along with the focus on slightly higher fat + salt and a little protein gets my mental and physical engines running and humming for several hours ~ craving-free. Afterwards, about mid-morning I may have a 'charged' or caffeine-free Keto OS, depending on my mood. We have our second and last meal by 4:00 ~ these days often a bit later than what we were originally aiming for, which was typically by 2:00. I can go longer before eating my second meal when incorporating the exogenous ketones into my routine. I not only don't have an appetite, I have absolutely NO thought about food. Pretty amazing. Takeya Cold-Brewed Coffee Maker makes a smooth-tasting, low-acid coffee concentrate. Heat ~ diluted with water, or straight for more of an espresso strength. Takeya Cold-Brew Coffee Maker review here. When hungry, I'll eat my first meal. Mid-morning, I'll shake up a Keto OS Orange Dream-cycle, or any of the other flavors. (Adding a little cream or milk of some sort makes a nice Cream-cycle flavor! Alternatively, I may have half a packet of the Keto Broth mid-day, followed by our second meal within a couple hours. I really enjoy having 1/2-1 full Keto Broth Salted Carmel packet in a mug of hot water in the later evening if I have already eaten my second and final meal, but still feel a little hungry. The Keto Broth Salted Carmel is not too salty, nor too sweet. It's just right. I find it very soothing to drink. I prefer the broth to eating any more food later in the evening, as I sleep better when I finish eating by 4:00 (or earlier), 5:00 at the latest. Open Swiss Cacao packet, and pour into your favorite mug. Add half the water. Stir. Add cream, and top off with as much water as desired, filling your mug. Stir, and enjoy! The Keto MAX Swiss Cacao tastes like hot chocolate without needing to add more cocoa powder. Feel free to add more if you desire, or add a scoop of the Vital Proteins Collagen. Variations: Use coconut cream in lieu of heavy cream if desired. Heat the milk/water/non-dairy milk until pretty warm. Add butter or cream. Let heat through. Add half to a blender. Add Keto OS Chocolate Swirl packet, and optional cocoa powder. Carefully blend. You may need to put your hand on the lid, and/or hold a towel over the top. Add the remainder, and blend until frothy. Blending it after warming the milk makes it nice and frothy, but if you prefer, blend milk and Keto OS packet first, then heat, and add butter. If desired, add 1/2-1 tbsp. of coconut oil and/or MCT oil in lieu of the butter or cream. The flavor is like a mildly chocolatey slightly salty hot chocolate without added cocoa powder, which I enjoy, but if you want a more chocolatey flavor, add the cocoa powder, or try the Swiss Cacao, below. Alternatively, I sometimes add 1 scoop of the Vital Proteins Dark Chocolate and Blackberry Collagen protein, and or 1-2 scoops of the Mocha Collagen Creamer. One scoop = 10g of protein, (5g for the creamer) plus you get collagen (great for your skin+) and a deeper, more rich, chocolatey flavor. Almonds are high in oxalates, so if choosing a non-dairy milk, I think coconut milk is best, unless you are pretty sure you well tolerate nuts and seeds. Many people do not, but do not realize it. Joint pain, skin break-outs, and digestive distress are a few potential symptoms. I personally do not consider almonds, and especially almond milk a super food, nor worth the price. If drinking almond milk, I suggest making it yourself, and soaking almonds over night first. Make it a meal, adding some super nutrient-dense eggs! Some people may be sensitive to raw egg whites. In that case, just add the yolks. Raw egg whites may increase histamine production in people who suffer from seasonal or food allergies. Place first five ingredients in a blender. Blend about 30 seconds. Add hot water, and blend another few seconds until frothy. Sub Vital Proteins Mocha Creamer, or a Keto Kreme Sweet Cream flavor packet for the coconut oil. I love the Keto OS MAX Vanilla Ski flavor in the eggnog. One of our faves, so if interested, grab it when it is available! It's great for making sweet keto treats with as well, like the Peanut Butter Fudge which is on their website. I don't eat nuts, or nut butters much right now, but it is good! Place packet of Orange Keto OS in a pint jar with a tight lid. Fill about half way with filtered water. Shake well to combine. Add 1/4 cup heavy cream, and more water until about 3/4 full. Carefully shake again. Drink and enjoy. Top with more water as needed, such as if it tastes too sweet. The Fairy Dust, Maui Punch, and Key Limeade are good just shaken in a jar with water. They range in flavor, and can taste pretty sweet initially for those who are not used to having much sweet flavor in their diet. The sweetness of any of their products can be mitigated by adding more water, or a little bit of something besides water, such as heavy cream, milk, half and half, coconut milk, or your favorite non-dairy beverage. By the way, the NAT means the ketones are derived via natural fermentation. Pruvit has a patent on this process. This makes them even more bioavailable. Even better that what is already great! They also have a specially blended MCT oil, formulated by Dr. Mary Newport. Read more about it here. And Keto Kalm teas, which contain L-Theanine, and can improve sleep. Pruvit is a community, and education-oriented company. The more I read and get involved, the more impressed I am! Want to try a 10-Day Experience Pack? Check out this 4 minute video. If interested, you can fill out the information for me to get your email. It will ask if you want a 5-Day pack. I really do recommend doing the full 10-days in a row. >>>Watch this video explaining why exogenous ketones can be so beneficial!! !